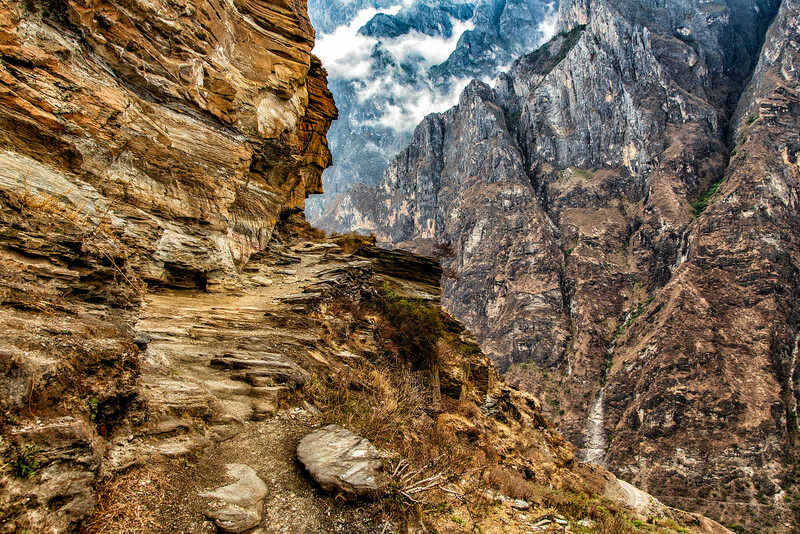 What is Tiger Leaping Gorge? Not so long ago, there were two beautiful trails through the gorge, an upper and a lower. The lower trail is now a road filled with mini busses packed with Chinese tourists, pedicab drivers and trucks laden with giant boulders. If you want a true hike, and to experience nature, your only choice now is the upper trail. There are certainly challenges, but the trails are lovely and quiet. You don’t need a guide; the trail is clearly marked with painted red arrows and blue directional signs all the way. 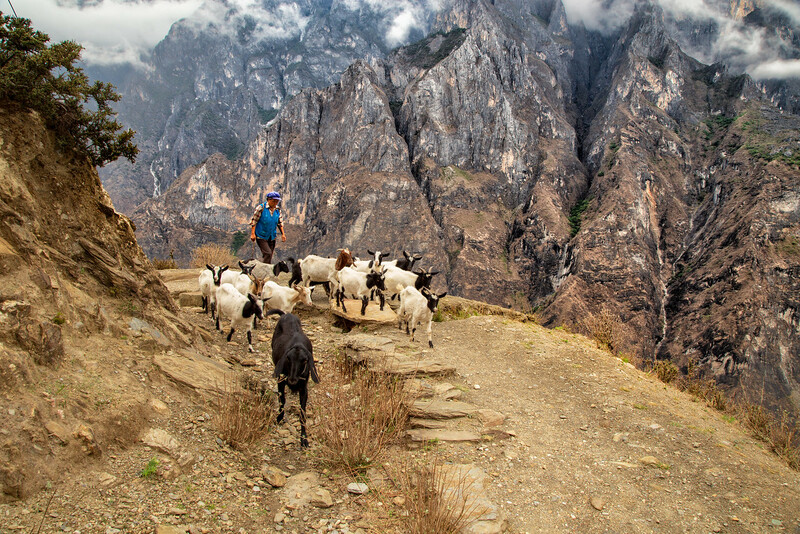 On our two days on the trail, we only came across a few other hikers and two goatherds on the entire hike. 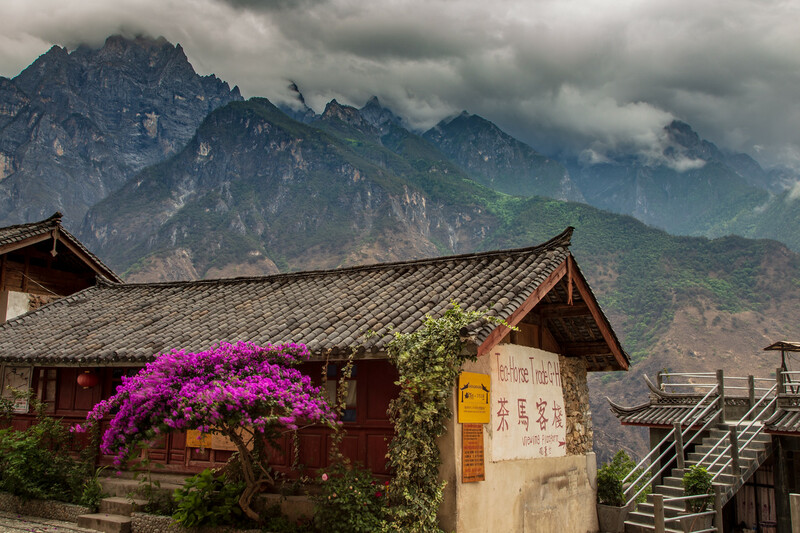 There’s a minibus run by Tina’s Guesthouse in the gorge that leaves Lijiang every morning at 7.30 AM and drops you off at the start of the trail. The price is 40 yuan (about $6.44 USD) per person. We booked this, as it was the most convenient and just a 5-minute walk from our guesthouse. Alternatively, you could make your way to the bus station, take a bus heading to Shangri-La and get out at Qiatou and walk about 20-minutes to the park entrance. Probably a lot cheaper but if your Mandarin doesn’t stretch beyond “Ni Hao”, then it’s going to get complicated! The bus takes about two and half hours to get to the entrance of the gorge. There is an entrance fee of 65 yuan (about $10.47 USD) per person. 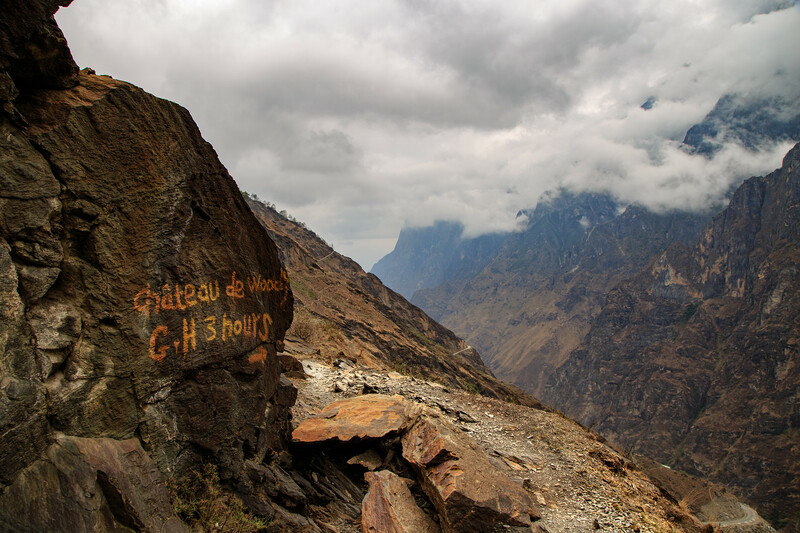 If you are doing the upper trek, the minibus will drop you off at the start of the trail. For those arriving independently, it’s about a one-kilometer walk from the entrance. Walk past the school and the trail is clearly marked on the left-hand side. For our first night, we had decided to stay at Naxi Family Guest House as it had had loads of good reviews on Trip Advisor. It only takes about 2 hours to walk here so most people just stop here for lunch and then continue on their way but we had already planned to go slow. On this part of the trail, you will come across guys offering to take you up by horse for a fee. They can be a bit persistent and Jonathan and I must have looked helpless because as soon as we started walking in the rain, this young Chinese guy started following us asking if we wanted horses. After explaining several times, “No, we are going to walk”, he turned off into his village, “Hurrah”, we thought, we finally got rid of him, but ten minutes later he reappeared with two horses! We ignored him and continued to walk. Eventually, he did give up. There is a confusing section at the beginning of the trail, where it is unclear which is the correct way to go, but just follow the horse poop and you won’t go wrong. 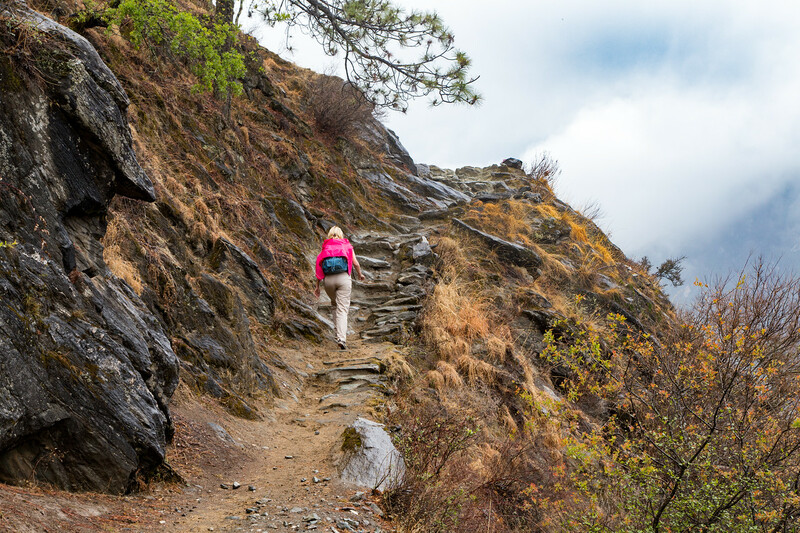 It is about a two-hour uphill climb and anyone with a reasonable level of fitness can do it. To be honest, given the steepness of the trail and how narrow it gets, I felt a lot safer walking than I would have riding a horse. At the scary bits, where the path gets very narrow and it is a sheer drop with a potential very, very long fall, it is gorgeous; I think. I was too scared to look and just clung hand over hand to the rocks. Fortunately, these very narrow scary sections are very short. We were cold and wet, but the welcome at the Naxi Family Guest House, and a warm cup of tea made us forget about our aching legs. The guesthouse was not glamorous in any way, but it was cheap, clean and comfortable. We stayed in a room with Wi-Fi, ensuite bathroom, a big comfy bed with electric blanket, and views over the gorge for 120 yuan (about $19.33 USD). There were cheaper alternatives with shared bathroom, but personally, I always prefer my own bathroom. The food was good; I can recommend the fried eggplants and the apple pie. The girls working at the guesthouse speak enough hotel English so everything was easy. We slept in and left the next day at 11 AM because we were only walking to the next guesthouse, which was about three hours away. The first part of the trail was a gradual climb, not too tough and only one kind of scary bit and a couple of quite scary bits. After about an hour, we reached the notorious 28 bends, supposedly the steepest and hardest part of the trail. At the base of the bends, a vendor sold water, snacks, and marijuana and told us the next snack spot was at least three hours away. Not true: the next vendor is just at the top of the bends. We didn’t think the bends were as difficult as people make them out to be. Steep definitely, but not much steeper than any other part of the hike. The trail here was fairly wide and there were plenty of rocks where you could sit, catch your breath and enjoy the view. We expected them to be a lot worse and were surprised how quickly we got to the top. At the top, trees block the view, but the vendor has thoughtfully made a platform you can walk on to for taking photos, for a fee! We considered giving in, but it was cloudy so we continued on our way. The next hour was a fairly flat wide trail through pine forests. A few narrow points but not as bad as day one or maybe, were we just getting braver. We stayed at the Tea Horse Guesthouse, the first guesthouse after the bends. Many people doing a one night hike, stop here or continue to the Halfway Guest House which is about another hour or so further on, but we had heard quite a few negative reports about the Halfway Guesthouse so settled on Tea Horse. From the outside, it looked quite nice, and although reports on Tripadvisor were quite good, the guesthouse was in need of much TLC. The family here could speak no English, but miming, “Can I have a room,” is quite easy. The food was pretty average, but the menu was in both Chinese and English and we were starving, so no problems there. The prices of the rooms were more expensive than at Naxi and they were not as nice, but they did have hot water for the shower, which is always a bonus. No Wi-Fi available but, as the signs always say, coming soon! The beers were cheap and of course, the views were great so all in all there was nothing to complain about. Unfortunately or fortunately, depending on your point of view, there are now roads leading up to all these guesthouses and it’s only a matter of time before the minibusses full of tourists will be coming to fill up the hotels. Great for bringing income to the villages, great for the tourists who want to experience the upper gorge without the effort of hiking, not so good for the hikers wanting to enjoy peace and quiet. The next day we set off hiking Tiger Leaping Gorge around 9 AM. The first part of the trail toward Halfway Guesthouse was fairly flat and wide. It was a relatively easy stroll through pine forests and offerings of great views across the gorge. There are now a couple of guesthouses now just before Halfway. Not sure if the first one was open but it looked quite nice but didn’t see a name. Near Halfway was a guesthouse named Come Inn which looked quite nice, but again not sure if it was open yet. We stopped off at Halfway for a cup of tea and to enjoy the view. 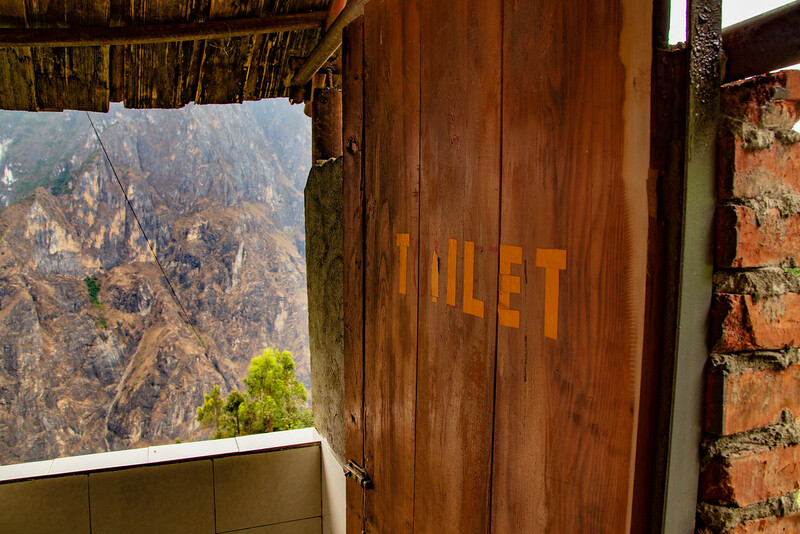 Halfway has what Michael Palin, in his book/televisions series “Himalaya” called, “most picturesque toilet on the planet” and I have to agree. It was a simple squat toilet suspended high over a cliff. It was a bit scary, but yes, the view from the loo is magnificent. The walk onward from Halfway continued to be fairly flat for a while, passing by a few gentle waterfalls until we saw a sign on the rock saying Tina’s (our destination!) was just 30 minutes away. We were ready for a pleasant stroll downhill, but oh no! Suddenly it was a steep uphill climb. Yes uphill! We weren’t expecting that. Not only was it uphill, but we soon found ourselves scrambling over slippery rocks from a landslide. There were still the red arrows pointing the way, so this landslide had obviously been there a while, but as hard as crossing it was, I can’t figure out why had no one had mentioned it. Then it was down, down, scrambling over more, now wet from drizzle rocks. This for us was by far the hardest part of the trail, but the good news was, if you slipped here, you were going to fall no more than 20 meters or so. At least it would be easy to recover your body. After what seemed like forever but was probably only about ten minutes, the worst had passed and now it was the pleasant downhill that we had expected, except now our thighs were burning and every step hurt but we made it. People said two baby boomers like Jonathan and me, we wouldn’t be able to do the trail but we did and we loved it! Yes, we could easily have done it as a one-night trip but I would recommend taking two if you have the time. We arrived at Tina’s Guesthouse in time for lunch. This is where the minibusses leave for Lijiang or onward to Shangri la every day at 3.30 PM. Fare to Lijiang Old Town is 55 yuan (about $8.86 USD). Lunch at Tina’s is cheap (prices from 15 yuan/ $2.42 USD) but nothing to get excited about. Here you can do a very steep walk down to the middle gorge and back, which should take around three hours, but you can get a decent view of the Middle gorge from the nearby bridge. Also, apparently on that hike, people pester you for money for crossing “their” bridge or their bit of the path, but we felt we had walked enough already and we really didn’t have enough time before the bus. Just around the corner from Tina’s is the Bridge Cafe, which offers much better views of the gorge and probably nicer food, but we only had time for a beer and a cup of tea. The bus left on time, and as seems to be the norm for bus drivers on mountain roads, he drove fast, overtook on blind corners all while chatting on his phone. Me, being the coward that I am, kept my eyes closed and prayed that I would see my dog and cat again; Jonathan excitedly recorded the journey on his iPhone. We survived and made it back in one piece. 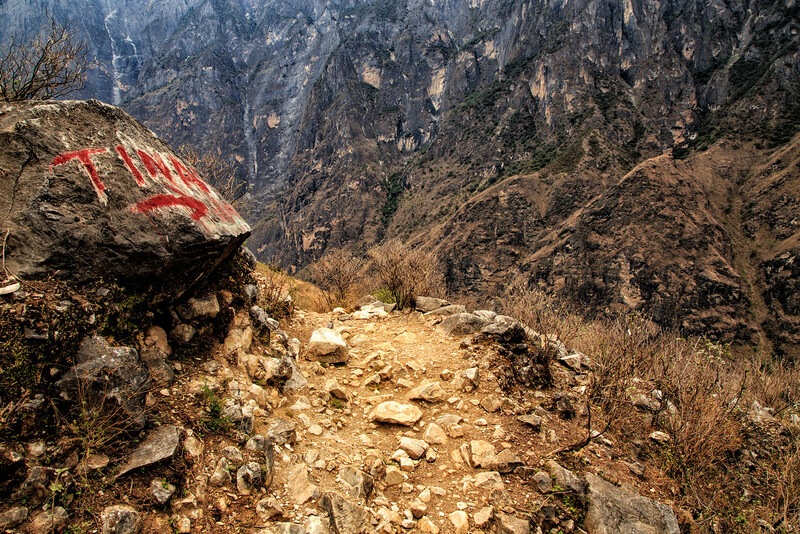 Should You Hike Tiger Leaping Gorge? 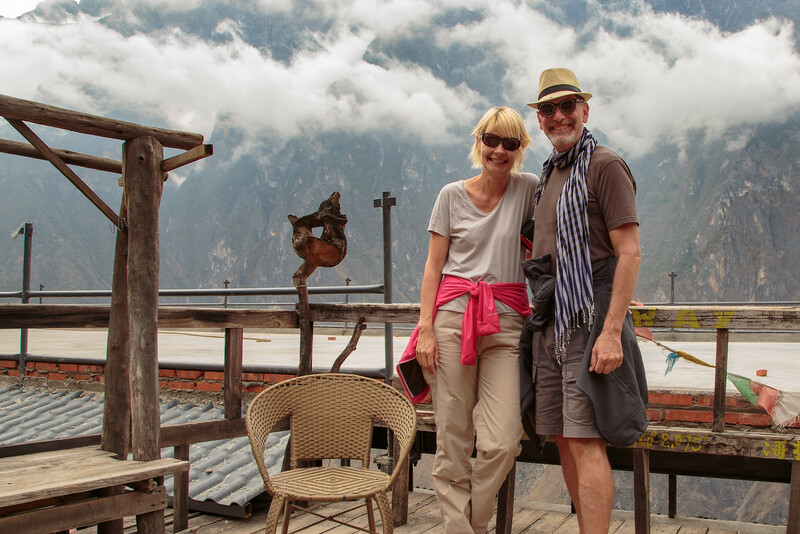 My advice, if you want to experience the solitude and the spectacular scenery you should go hiking Tiger Leaping Gorge now! The modern world is encroaching fast including building a fast rail tunnel link through the mountains to Tibet.